Barcelona had five main areas of interest for us as tourists. First was the Barri Gòtic (i.e., Gothic Quarter), the old Roman and medieval center of the city. Second was El Born, somewhat indistinguishable from the Barri Gòtic but a little trendier for shopping and nightlife. Third was the harborfront and Barceloneta, with its promenades and beaches. Fourth was L'Eixample (i.e., "The Expansion"), a modernista explosion of the city outside its old medieval walls. And fifth was Montjuic (i.e., "Mount of the Jews"), holding an old fort, the city's Olympic stadium, parks, and art museums. 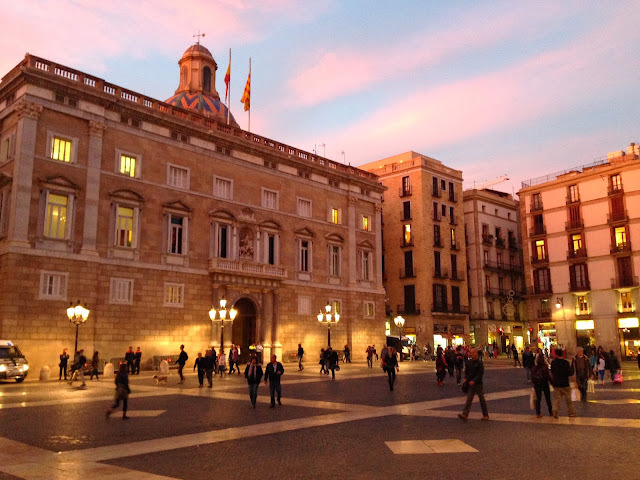 The Plaça of Sant Jaume (i.e., St. James square) at dusk, facing the offices of the government of Catalonia in the Palau de la Generalitat. View of just part of the cityscape from a cable car heading up Montjuic. 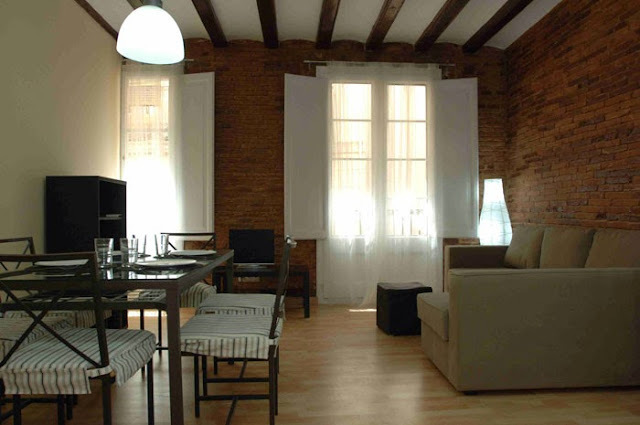 We chose to stay in the Barri Gòtic, instead of a fancier or swankier locale like L'Eixample. Why? Because the Barri Gòtic is the heart of the city. Many of Barcelona's tourist sights are situated in it or lie within easy walking distance. It's bordered by La Rambla, one of the city's main promenades. It has several convenient Metro stops. It overflows with restaurants and shops. 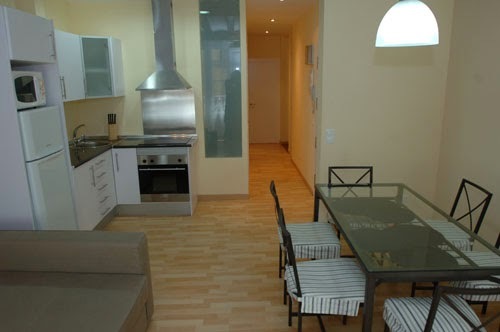 And if you avoid the costly hotels, it's cheaper than a neighborhood like L'Eixample. 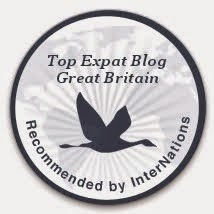 Why did we choose an apartment over a stay in a hotel or a bed and breakfast? 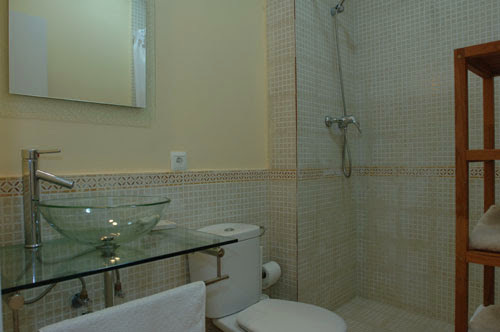 The location of the apartment was excellent; if it hadn't been central, we wouldn't have stayed in it. Cost was also a consideration. It was cheaper to rent an apartment for a week than to stay in a hotel, no matter where that hotel was located. Our cheap flights from Glasgow -- only £32 pounds roundtrip airfare for each of us on Ryanair -- had helped us decide to go to Barcelona in the first place, and we didn't want to negate our airfare savings with expensive lodging. More importantly, however, was the freedom it allowed Jackson. He had room to roam, with a living room, hallway, and two bedrooms. He had his own bedroom, which made it easier to put him to bed and more comfy for all of us than sharing a single room in a hotel. He could make noise, run, eat at his own pace, open and close the door to the Juliet balcony, and so on. It's hard to impose on a B&B (and its other guests) with a rambunctious toddler for a week. Getting an apartment also gave us more freedom for meals, making our own breakfast and a couple of dinners, as well as shopping for things like milk, eggs, butter, fruit, bread, etc. Outside the door to our apartment building on Carrer Obradors. View from our little balcony. 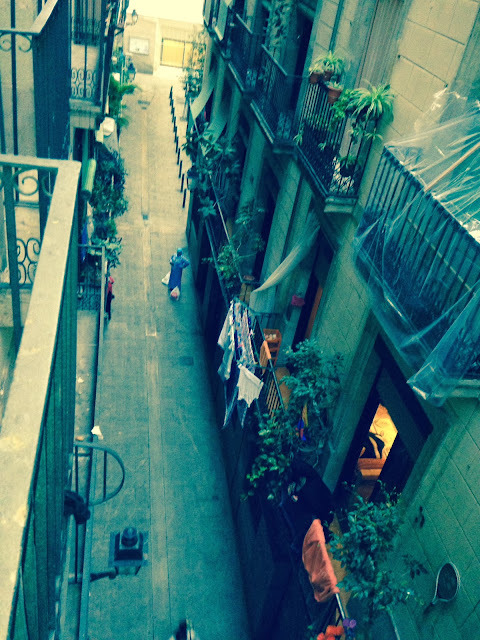 In the Barri Gòtic, all of your senses are actively stimulated by the urban environment. Everywhere you look are narrow lanes, often with shops on the ground floor and three or four floors of apartments above them. It's perpetually dim; many of the streets are so narrow that sunlight seldom if ever directly hits the ground. Your ears hear a constant din of conversation or impassioned arguments or shopkeeper entreaties. Though the quarter is primarily pedestrian and few vehicles are allowed onto many of the lanes -- mostly taxis and municipal service vehicles -- a single scooter or a garbage truck can reverberate for blocks. This photo was taken near midday; no direct sunlight reached the ground on this day. The smells can be powerful and unexpected. Since Barcelona is generally warm (it was mostly in the low 70s Fahrenheit during our trip in early November), windows and doors for homes and restaurants stand open to passersby with the smells of cooking. Unfortunately, one of the most common and pungent fragrances we encountered was urine. In a dense urban environment like the Barri Gòtic, with virtually no grass to be found, dogs pee on the streets and the sides of buildings. Well, we assume it was dogs, though we didn't see all that many of them. The smell of urine was a frequently recurring motif during our trip. Battling the smells are early-morning battalions of powerwashing and streetsweeping, leaving wet flagstones that often don't dry completely before the next washing. Hmmm, which of these stones should I pee on? Your sense of touch is constantly engaged with the jostling and maneuvering amongst the pedestrians. Your footing is mostly secure, though some uneven roads and the endless puddles (hopefully water, but not always) can prompt an extra jolt in your step. The width of some lanes is so small that you can nearly reach out and touch the buildings on opposite sides. Finally, you have a constant invitation to taste, with abundant choices not only from tapas bars but also dozens of ethnic varieties nearby. Just within a couple hundred feet of our sidestreet apartment were an Italian restaurant, a French patisserie, a coffee shop, a Greek restaurant, two or three tapas bars, an ice cream shop, an Irish pub, and two convenience stores. A narrow lane in the Barri Gòtic. Just beyond that archway, in a tiny courtyard, are a few pillars left over from a Roman temple of Augustus. Corinthian columns for the temple worshiping Emperor Augustus as a god, erected in first century B.C. when the town was called "Barcino." This lane is in the Jewish quarter called "El Call," which literally means "narrow passage" or "alleyway." Prior to a 1391 massacre and forced conversion, around 4,000 Jews were forced to live in a handful of these narrow alleys. Though we currently live in a city, Glasgow, and previously lived in the city of Raleigh in North Carolina, the houses where we have lived are more suburban than urban. During our visit to Barcelona, it was a nice change of pace to live in a densely urban environment with its attendant noise and bustle and activity. While we can and do walk to many more places in Glasgow than we did in Raleigh, the shops and people and restaurants and tourist attractions are not right on our doorstep like they were in Barcelona. I don't know if I would want to live in such an environment long-term -- we wouldn't do so without a decent yard for our dog -- but shaking up our usual routine was fun and invigorating. The main drag bisecting the Barri Gòtic, Carrer de Ferran, perhaps the widest street in the old Gothic quarter.